Excerpt from "Dog Sense," by John Bradshaw. There are probably few problems in store for a dog whose owner mistakenly believes it is grieving, since the owner’s reaction will presumably be an affectionate one, but the misattribution of guilt can have serious consequences for the dog. Many dogs upset at being left alone by their owners. As a consequence of the insecurity they feel when alone, they may do things that their owner will disapprove of–for example, chewing the frame of the door that the owner left through or trying to bury themselves under the sofa cushion and damaging them in the process. The returning owner sees the damage and immediately punishes the dog, thinking, almost certainly wrongly, that the dog will associate the punishment with the ‘crime’ and thus not do it again. In fact, quite the opposite will occur: Because the punishment is associated with the owner returning, the anxiety felt during separation intensifies, making it more likely that the dog will be driven by its insecurity to do something the owner disapproves of while the owner is away. More punishment follows, and so a vicious cycle ensues (one that can last for years unless the owner seeks expert help). 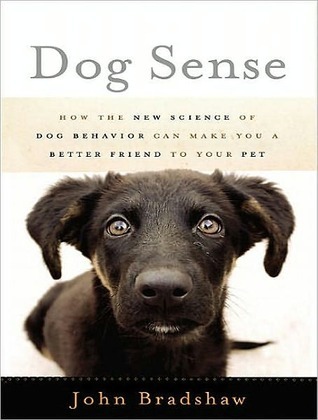 Indeed, a dog’s life can be ruined by a simple and easily corrected misunderstanding of its emotional intelligence. Yes! Very very true, and a great passage to illustrate it. Thank you! oh man! This is sooo true! I’m looking forward to your review! This is actually the main reason Moree and Smokey were kept in the garage when we were gone for long periods of time (with dog beds, water and toys), and why Junebug got a crate when she was a puppy. We wanted to always be happy to see them when we got home, not unhappy that something had been chewed or there had been an accident, so we gave them an environment where we didn’t have to worry about it. I’m glad you read the book. Some people are missing the point though… A puppy does not belong in a crate and I cannot imagine why a dog should be kept in a garage…. My Beagle LOVES her crate. She’ll crate herself sometimes when she wants some downtime. Dogs are denning animals, and, in general, do really well in crates. She was put in her crate when we were going to be out because she was a destructive chewer. And as a Beagle, didn’t care what she chewed. Crating her kept her safe (we lost a dog to bowel obstruction surgery) and prevented her from destroying anything. We would get home, open her crate, and sometimes she would just stay in there napping for another half hour or so. As for a garage, that’s obvioulsy a terrible place for the dog, given that it’s attached to the house, so is warm (or cool in the summer) and dry, there’s food and water, dog beds, an old couch, and plenty of dog toys. Not really certain how its different from being in the main part of the house except that I could hose the floor down if there was an accident while we were gone for the day. My Beagle does not live in her crate, nor did my boys live in the garage. That is simply where they spent time while we were out. But I guess, if, in your opinion, taking proactive steps to keep my dogs safe and prevent them from destroying property while I am out of the house makes me a bad pet parent, then nothing I say will change you opinion. Of course, as long as my dogs are healthy and happy, your opinion doesn’t actually matter (it just annoys me).